9.○上田純平, 宮野 隼, 田部勢津久, "Ce3+-Yb3+共添加残光蛍光体における電子トラップ濃度の見積もり"
31. K. Asami, J. Ueda, S. Tanabe, "Red-shift of emission wavelength in Ce3+ doped garnet phosphors by Si4+-N3- incorporation for warm-white LED "
"Rechargeable Persistent Phosphor of Er3+-Cr3+ Co-doped Garnet Covering the First and Third Biological Windows"
"A rechargeable garnet persistent phosphor for the first and third biological windows via persistent energy transfer and electron trap engineering"
複合アニオン化合物の創製と新機能」キックオフミーティング　(福岡, 5/29,2017) 優秀ポスター賞 受賞! 24. K. Asami, J. Ueda, M. Kitaura, S. Tanabe, "Construction of vacuum referred binding energy diagram for understanding electronic structure of Ce3+ doped Gd3(Al,Ga)5O12 phosphors"
"Near-infrared multi-wavelengths long persistent luminescence of Nd3+ ion through persistent energy transfer in Ce3+, Cr3+ co-doped YAGG for the first and second bio-imaging windows"
1. ○A. D. Sontakke, J. Ueda, S. Tanabe, "Sensitized infrared luminescence in Ce3+-Yb3+ doped borate glasses"
31.Y. Zhuang, S. Tanabe, "Broadband near-infrared luminescence in Cr4+-activated transparent glass ceramics"
"Electronic Process from 5d State and Electron Trap in Eu2+-Dy3+ Codoped SrAl2O4 Ceramic Phosphors"
11. S.Tanabe,"Gain Spectral Hole-Burning in Er-Doped Fiber Amplifier:Spectroscopy and Technological Impact in WDM"
6. S.Tanabe, J.Ueda, "Rare-earth Doped Phosphor Materials for Green Technologies." 24. S.Ye, S.Tanabe, "Spectral Modification from Yb3+ Doped ZnO with Li+ Addition for Silicon Solar Cell"
25. J.Ueda, S.Tanabe, "Preparation and Optical Property of Glass Ceramics Containing Ruby Crystals"
"Preparation and Optical Properties of Transparent Ce3+:GdYAG Ceramic Phosphors for White LED "
27. Y.Katayama, S.Tanabe, "Afterglow characterization of CaTiO3: Pr3+ prepared by solar furnace"
中西君,"IUMRS-ICA2008 Award for Encouragement of Research in Materials Science"(Encouragement Prize for Young Researchers)若手奨励賞!! 7. ○S.Tanabe, T.Nakanishi, S.Fujita, "Glass ceramic Phosphors; All inorganic solution for solid-state lighting"
6. ○S.Tanabe, T.Nakanishi, "Silicate glass ceramic phosphors for solid-state lighting"
18. ○T.Nakanishi, S. Tanabe, "Preparation of BaSi2O5:Eu2+ glass ceramic phosphors and luminescent properties"
12. ○村上 岳、田部 勢津久、"Temperature dependence of 1.3μm emission of Pr-Yb codoped transparent glass ceramics"
8. S.Tanabe, "Glass ceramic phosphors for solid-state lighting"
7. ○D.Zhang, S.Tanabe, "A Non-destructive method to detect the signal amplification process along Erbium Doped Fiber"
"Preparation and efficient 1.3um emission of Pr3+-doped transparent nano-glass ceramics containing SrF2"
3. S.Tanabe, "Transparent glass ceramics doped with Cr4+ for a broadband amplifier"
2. ○S.Tanabe, H.Yamazaki, "Spectroscopic properties of Er-doped Y3Al5O12 and Y3ScAl4O12 garnet crystals"
22. ○S.Tanabe, D.Zhang, "Power budget of Er-doped fiber evaluated with integrating sphere"
XI International Conference on the Physics of Non-Crystalline Solids (Rhodes, Oct.30, 2006) O-OP-8. "Preparation and NIR-emission of light rare-earth doped transparent nano-glass ceramics containing SrF2"
15. ○S.Fujita, S.Yoshihara, A.Sakamoto, S.Yamamoto, S.Tanabe, "YAG glass ceramic phoshors for white LED"
13. S.Tanabe, "Theoretical Aspects of Rare Earth Ion Spectroscopy for Optical Amplifiers and Solid-state Lighting"
10. S.Tanabe, "Development of Glass Materials for Broadband Amplifiers for Wavelength-Division-Multiplexing"
9. 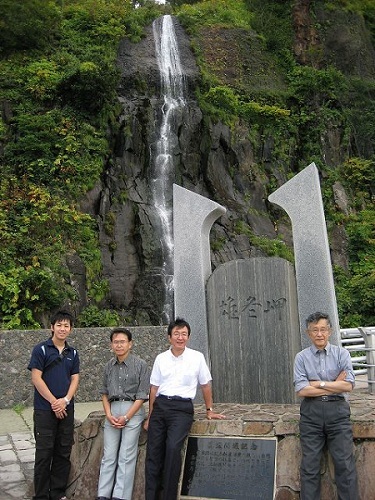 S.Tanabe, D.Zhang, "Power budget of side-spontaneous emission of EDF evaluated with integrating sphere"
"Investigation of Side Spontaneous Emission of Silica-Based Erbium Doped Fibers by Integrating Sphere"
Optical Amplifiers and Their Applications 2006 (Whistler, June 28, 2006) JWB38. 国際会議デビュー!! "Fluorescent Characteristics of Er3+-doped Ce1-xYxO2-δ Crystals for U-band Optical Amplifier"　国際会議デビュー! !